The 2018 Jinji Lake Travel & Shopping Festival (JLTSF) sponsored by Jinji Lake Scenic Area kicked off in SIP on Feb 1 and will last till Mar 2. The application of Virtual Reality (VR) technology is a highlight at the event. An off-line game called "Gold Coin Catchers" went on from Feb 2 to 4, allowing the players wearing a VR device to collect "gold coins" that could be exchanged for gifts and vouchers provided by six local stores and shopping malls. Couples and lovers are having the chance to experience"harmonious heartbeats" through a romantic heart-shaped installation at Yi'Oulai Outlets. The installation was designed by a renowned French new media artist for the installation art exhibitions scheduled at Shanghai and Suzhou from Feb 3 to Mar 11. When the couples put their fingers on the sensor, the lamps will change colors with the rhythm of their heartbeats and the same color will appear when their hearts beat synchronously. 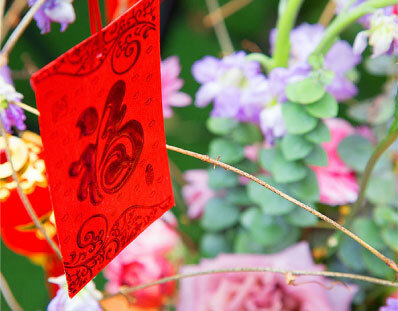 The JLTSF includes a variety of theme events to celebrate the Chinese New Year in both traditional and modern ways. There were a series of events at old Xietang Street, presenting Spring Festival couplets and desk calendars to the participants and offering free lectures on sinology to children. Additionally, a flower exhibition was held at Huahaifang Street. The elaborately designed events during the JLTSF have received positive response from the tourists and locals. For example, the Spring Festival fair at Shin Kong Place enabled the citizens to add more high-quality and inexpensive items to their stock for the Chinese New Year, while the installation art exhibition, lion dance show and traditional handicraft demonstrations greatly enriched people's Spring Festival holiday.